Elections! Our great privilege and responsibility. Here's hoping we can keep our Allegiance strong. Design size is 99 x 40. This was designed to be added to your bowl of Patriotic smalls. 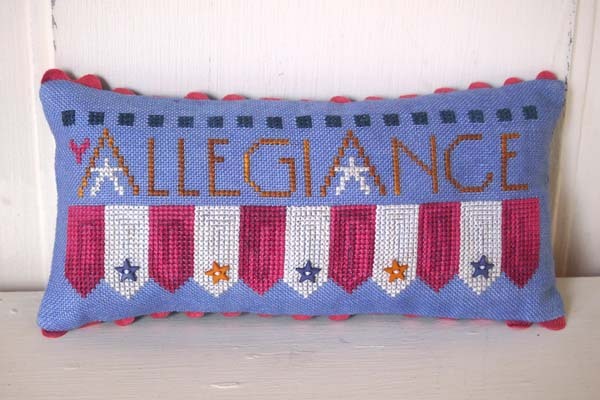 Allegiance is stitched on Weeks Dye Works 30 count Periwinkle linen using The Gentle Art Freedom and Toffee plus Weeks Dye Works Grits and Romance floss. Buttons are included within each package, so be sure to add them to your floss ring, or keep them inside the pattern bag, as they are not available separately. Simple sewing finishes the pillow, with Dames of the Needle 1/2" Mild Chili ric rac.